I had the opportunity to talk with scalability gurus and former ebay architects Marty Abbott and Tom Keeven. They talked about the idea of operation teams monitoring business metrics as an indicator of system health. Here’s an example (not real data from my company!) 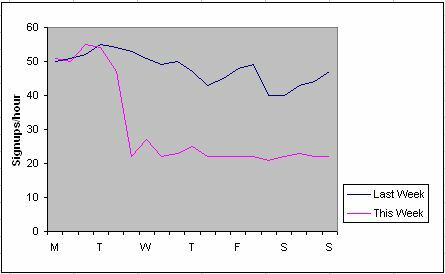 of week over week graphs of user account signups/hour. You should pick the metrics and sampling rate to be statistically significant and also keep in mind that seasonal variations and even social events can affect some types of web business metrics. They sited a fun example from when they were at ebay, of noticing a significant drop in use of the site at 7pm eastern time on a Monday. It took them a while, but they finally figured out that was when American Idol was on! They ended up installing a TV in their Network operations center.